The Greater Lansing Baby Fair is hosted by Willow Tree Family Center, a 501 (c)(3) not-for-profit organization serving pregnant women and young families in the Greater Lansing area. Our mission at Willow Tree Family Center is to grow strong, empowered families by providing support groups and educational services for pregnancy, birth and beyond. By focusing on the family as a system and providing access to evidence-based resources and holistic care, we will support healthy, informed, confident families. We envision a central place where families can gather from the moment they find out they are expecting. Through our work to make evidence-based and holistic resources and care available to ALL families regardless of race, ethnicity, belief system, age, marital status, sexual orientation, or socio-economic status, our center will make the wisdom, strength, and serenity attributed to the willow tree available to the entire community. For more information about Willow Tree Family Center, please visit our website at www.willowtreefamily.com or contact us at support@willowtreefamily.com. This year, we are proud to be supported by our sponsors, exhibitors, and community partners. This year the event is being held at the Lansing Center. The City has metered parking which is free on the weekends, and the adjacent private lots are also open. Some of these lots include the large parking lot behind Biggby, across from the Lugnuts Stadium, and the parking lot right by Impression 5, directly across from the Lansing Center. 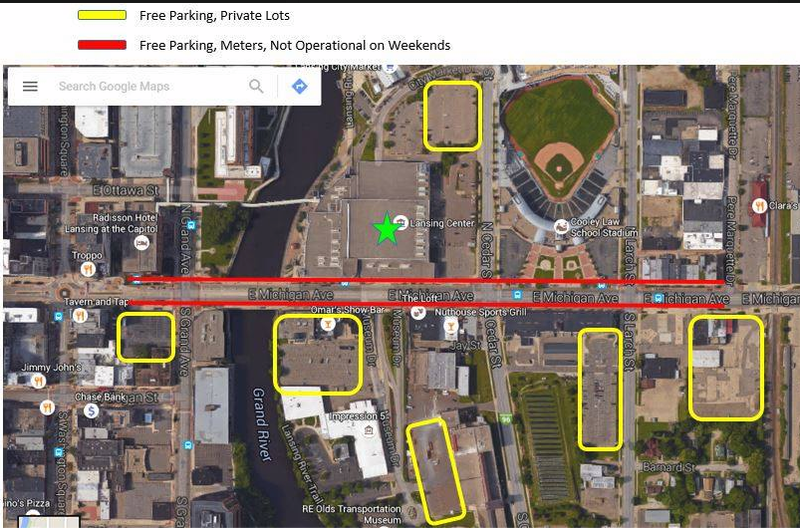 Below is a map showing parking options; the green star is the Lansing Center. There is also paid parking in the ramp beneath the Lansing Center for $7/car. You sure can! Mid-Michigan Babywearers will also be on hand to teach safe babywearing if you want to learn more. Please email us at lansingbabyfair@willowtreefamily.com for more information.